Every once in a while, I want to say the above words to people. The reason? It’s mainly because I get a kick out of it. And occasionally, I even want to say those words to myself. This week, I directed a stern “Go soak yourself” line toward…well, myself. (And my messy hair). The last several months have included one project after another, with large helpings of travel, general hecticness and holidays thrown into the mix. 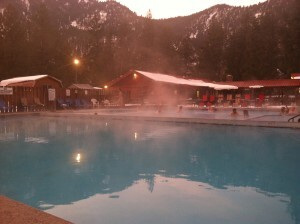 So, I realized how wise those words were, took my own advice and headed off to Quinn’s Hot Springs Resort for a proper soaking. En route to Paradise. Montana was in fine form. 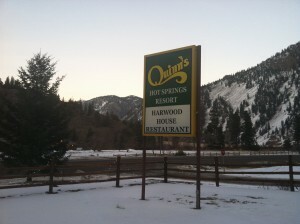 Located on Highway 135 between St. Regis and Paradise, Montana, Quinn’s sits on the banks of the Clark Fork River. And I must tell you, it is one of the loveliest locations in the entire state of Montana. 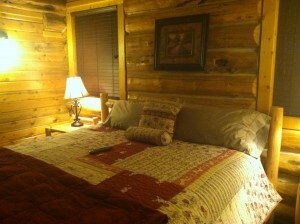 With no street lights, no neighbors and no cell service (it does have Wi-Fi), Quinn’s gives you the opportunity to fully relax in the crisp mountain air of Western Montana. 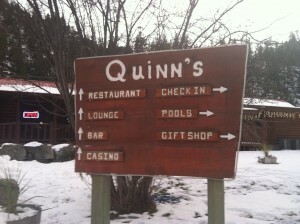 Getting my bearings at Quinn’s Hot Springs Resort. Around these parts, hot springs are revered. Called “big medicine” by the Pend d’Oreille Indians, people have traveled from near and far to soak in the healing waters found around the region. While there are several developed and natural hot springs pool found around Glacier Country, Quinn’s has on-site lodging–ranging from private cabins to lodge rooms–as well as meeting space, a bar, gift shop and restaurant. -While you’re soaking in the pool, look up. You’ll be rewarded with an unrestricted view of the night sky. -Bring slippers, sandals and a robe for navigating from your room to the pools. -Order dessert. My recommendations are the huckleberry ice cream and creme brulee. -If you’re visiting during winter, pack your snowshoes and explore the nearby trails. 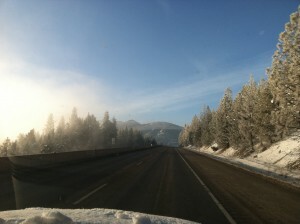 This entry was posted in From The Road, Hot Springs, Stay, Things To Do, Winter Fun and tagged Hot Springs, Montana, Winter Fun on January 24, 2013 by tiatroy.